Natural tracers can be used in arid regions to gain an understanding of streamflow generation and seasonal streamflow sources; their application can support water resources management, water quality studies, and assessments of the impacts of climate change. 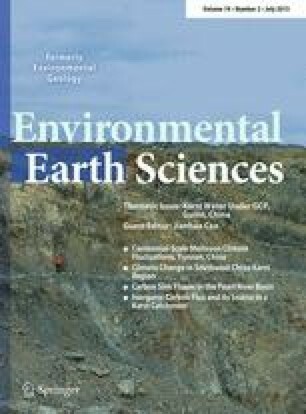 In this study, we identified hydrological processes in different seasons based on the chemical and isotopic compositions of the Urumqi River. Stable isotope (18O and D) ratios and major ion concentrations were measured on a monthly basis at six sites along the Urumqi River from December 2011 to October 2012. Most waters (groundwater, precipitation, glacier, meltwater, and river water) of the Urumqi River basin are the Ca–HCO3 water type. In the slow flow period, the ionic composition of the river water reflects weathering and dissolution of dolomite and gypsum. Water–rock interactions control the hydrochemical processes during the slow flow period, while the hydrochemical characteristics of river water in the quick flow period are controlled by precipitation, glacier water, and groundwater. The seasonal variation in river δ18O and δD values at different sites was similar to that of water entering the headwaters of the Urumqi River basin. The isotopic composition of precipitation was evaluated to obtain information on the effects of subcloud evaporation and moisture recycling on the formation and isotopic composition of precipitation in arid climatic conditions. We identified five different periods in streamflow using water chemistry and isotopic composition. This research is supported by the National Natural Science Foundation of China (Grants 41101042, 41471030), and the One Hundred Talents Program (No. Y071121) of the Chinese Academy of Sciences.